Natalie has been faithfully working the last few afternoons to complete her science packet, a rare piece of homework for my third-grader. She finished it a few minutes ago and proudly presented it to me (a self-professed science nerd; Bill Nye the Science Guy, anyone?) to exclaim over it in all its technicolor glory. 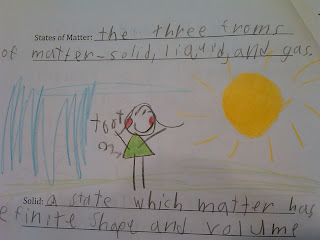 She's learning about matter right now -- including the standard three forms of matter we all learned when we were young. You remember those, don't you? Here's Natalie's illustration to refresh your memory. I wasn't able to keep a straight face completely, but I didn't bust a gut laughing either. I consider that a parenting success. In other news, I wrote a piece for 5 Minutes for Parenting yesterday about the love-hate relationship I have with pregnancy (and then I forgot to cross-link it; pregnancy makes me forgetful). It all began when I had a conversation with my sister, in which she wished she were in labor. (Those of you who know Emily aren't surprised by that one iota.) You can read it here. Well, I DID bust a gut laughing! Then again, I'm not her momma. Heh. I completely cracked up when I saw Natalie's picture- blushing cheeks and all! :) She is adorable. I can't believe she is 8.5! Love the blog makeover, although I loved your old site too. How on earth did you get your header to do that? OH NO SHE DITTENT! That's hilarious! Has she turned it in yet? Can't wait to hear what her teacher said, if anything! :) So funny that the same little girl working so seriously over those cookies drew that decidely unserious picture! Hee hee.